Surely IM Good is a 2003 AQHA Bay Stallion. 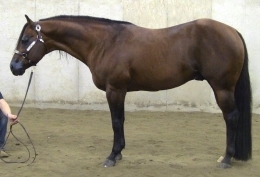 He is sired by the infamous stallion Zippos Mr Good Bar & out of the legendary mare Miss Surely Bars. He has a Superior in Open Western Pleasure & is the earner of over 175 pts. Out of 36 foals he has produced earners of over 1020 points & $24,631.64 in earners. He is nominated to NSBA Futurity, Tom Powers, Buckskin Assoc. of MI QH Futurity, Ill QH Futurity, IA QH Futurity & Go For Gold. See more pictures on our web site.